Having a dog means having to deal with a lot of different kinds of stains! Pee stains drool stains, vomit stains and of course, poop stains! If you are wondering how to get old dog poop stains out of the carpet, look no further! We will tell you some great ways you can make your carpet look as good as new once again! You will also read reviews of special poop stain removers, such as the Simple Solution Oxy Charged Stain & Odor Remover, you can get from Amazon now! 1 Why is it important to remove old dog poop stains? 2 How to remove old dog poop stains from carpet using vinegar? 7 How to remove old dog poop stains using hydrogen peroxide? 8 How to remove old dog poop stains using a brush? 9 How to remove old dog poop stains using a dull knife? Why is it important to remove old dog poop stains? 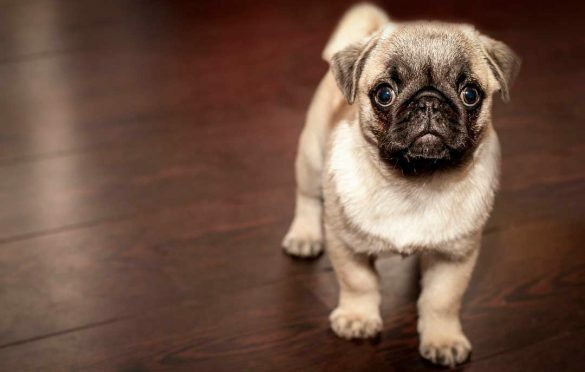 Ignoring the obvious fact that dog poop stains can ruin the entire look of your beautiful carpet, they also stink! Other than that, dog poop contains a lot of bacteria and parasites, which can be harmful to the family. It is recommended to remove any poop stain right away and not let it sit there and get dry. But in case you come across an old dog poop stain than follow the tips below and you’ll be able to get it out. How to remove old dog poop stains from carpet using vinegar? In 2 cups of warm water, mix one tablespoon of any dishwashing liquid, and one tablespoon of white vinegar. Now, using a clean sponge, apply the solution to the old poop stain on your carpet. Keep blotting the stain until the liquid is absorbed completely. Keep repeating it till the stain gradually disappears. After this, you can clean the carpet with clean water and dry it off. For most old dog poop stains, the above-mentioned tricks might do wonders. However, some stains are more difficult to remove than others. In that case, here is our pick of the 3 best commercial cleaners for removing old dog poop stains from your carpet. 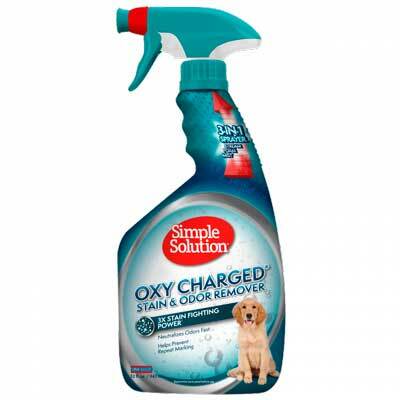 Simple Solution Oxy Charged Stain & Odor Remover works really well on new as well as dated dog poop stains. Doesn’t leave any harsh smells after cleaning. It also removes blood and grass stains. All you need to do is spray the solution on the stain and let it sit for a few minutes. The bad poop smell will go away as well. The product really does live up to its name! Simple Solution provides you with just that; a simple solution to remove all pet stains and odors from your carpet. However, using the product a few times on the same area might cause your pet to stop remarking the area due to the innate smell of the formula. A simple, no scrub solution which removes all pet stains within seconds. Click here to check the current price on Amazon. Stain Fu Carpet Stain & Odor Remover works exceptionally well on diarrhea stains. It is gentle enough to use it on a variety of fibers such as viscose, wool or cotton. You don’t need to scrub. Just spray on the stain and let it sit for about 20 minutes. Afterward, blot the stain with a clean towel, and it will disappear. A fast working solution to remove all kinds of pet stains and odors with ease, Stain FU is an ideal product for homes with dogs that have “accidents” around the house. Instead, it is best to simply blot the stain to avoid any damage to your carpet. 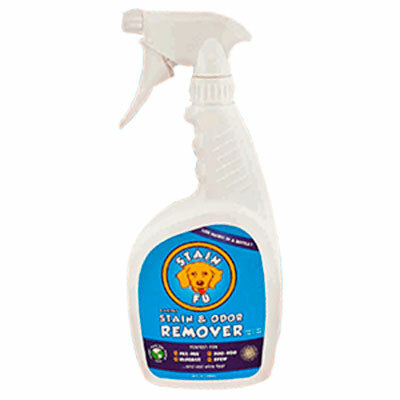 One of the most versatile pet stain removers. Click here to check the current price on Amazon. Bodhi Dog Pet Stain & Odor Remover is a natural stain remover that doesn’t contain any harsh chemicals. If you have a dog that is sensitive to many chemicals, this is the solution for you. Although it is a completely natural solution, it is mighty when dealing with organic stains such as dog poop. 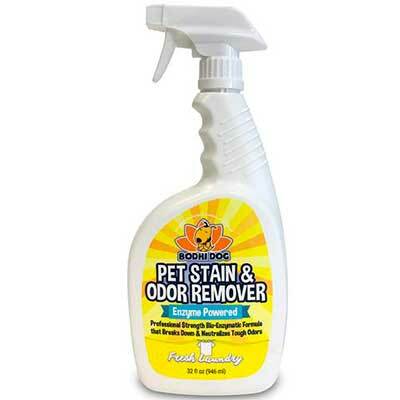 This bio-enzymatic pet stain cleaner removes old and new pet stains alike, along with any lingering odors. However, since the product is completely chemical free and plant-based, older, stubborn stains might take a few more cleaning sessions to completely remove all stains. A cruelty-free, organic product which works miracles. Click here to check the current price on Amazon. How to remove old dog poop stains using hydrogen peroxide? Hydrogen peroxide is a mild bleach which can be easily bought from any store. However, keep in mind that it is still bleach, and must be used with a lot of caution. Use an eye dropper and apply a few drops of hydrogen peroxide to the old dog poop stain on your carpet. Remember to use protective gloves when doing this. On the same spot, apply a few drops of ammonia as well. Once this is done, use a clean sponge and some cold water to blot the area. The stain, along with any smell, should disappear without a trace! How to remove old dog poop stains using a brush? Sometimes, the old dog poop stains are quite stubborn and may have caused the area on your carpet to dry up and harden. Take a bucket of cold water and add some dishwashing liquid to it. You can also add just a splash of white vinegar, which will help with the smell. Using a soft cloth or a sponge, blot this liquid on to the stained area on your carpet. Now, using a soft bristled brush, gently run your brush on the stained area to loosen up the hardened carpet fibers. Be gentle with the brush, as you do not want to damage the carpet fibers. Continue doing this till the stain is removed, after which you can sprinkle some baking soda on the stained area of the carpet. Rub in the baking soda into your carpet using your fingers or gloves. Allow it to sit overnight and then remove the dried out soda with a vacuum cleaner. If you have a steam cleaner or a carpet cleaner go over the stain a couple of times. How to remove old dog poop stains using a dull knife? Using a sponge, blot the stained area on your carpet with a mixture of water and dishwashing liquid. Now, using the edge of a dull knife, scrape off any solids that you can see, or use the knife to loosen up any tightened fibers on your carpet. Take four parts of water and add just 1 part of carpet shampoo to this, and apply it on to the stained area on your carpet. Let this dry, and then run a vacuum over the area. Cleaning up dried up dog diarrhea from your carpet does not need to be an overwhelming task. The first thing you need to do is remove any solidified pieces which you can. Make sure you are wearing protective gloves which doing this, as these contain a lot of germs and bacteria. Dispose of these in a plastic bag. The next thing you need to do is rehydrate the dried up diarrhea. Create a mixture using white vinegar and water in a spray bottle. It will help break down the hardened residue and make it easier to remove. Spray the mixture on the carpet where the dried up diarrhea is and allow it to sit undisturbed for about 10 minutes. Once the area is completely saturated, you can paper towels to blot it up. Once you have done this, take some hydrogen peroxide and drop it directly on to the stains on your carpet. You do not need to let the hydrogen peroxide completely saturate the area; however, make sure that you apply just enough to cover the stained area. Allow it to dry naturally. If you find the stains to be stubborn, sprinkle some baking soda on top of the stained area and use a brush to work into the fibers of the carpet. Let it sit undisturbed for an hour, then blot away. The faster you work, the better results you can get. As soon as you see the dog diarrhea on your rug, immediately remove as much as you can use paper towels and a plastic bag. Do not blot the stain as it will spread further. Make a soapy water mixture using laundry detergent and hot water. Spray this on to the affected area immediately. Let it sit undisturbed for 10 minutes. Take a soft bristled brush, dip it into the soapy water solution and start working on to the fibers of your rug. Rinse out the rug carefully using cold water and eradicate the detergent. Create a mixture of water and white vinegar and spray this directly on to the stained areas on your rug. It will help remove any odors as well as remaining stains from the rug. Pat the area using paper towels to remove any excess and allow it to dry naturally. Sprinkle baking soda on the area and let it sit for 24 hours before vacuuming the area. Maintaining a white carpet can be difficult as it is, but having a pet can make it even more difficult. For removing dog poop stain from white carpet, the first thing you should do is use a fork or a spatula to remove as much of the dried residue so that it does not spread further. In a large bowl, mix 1.5 cups of warm water with 1 cup white vinegar. Use a vacuum cleaner first to go over the stained area and remove any leftover chunks from the carpet. Pour the water-vinegar solution over the stained area of the carpet and allow it to sit for 10 minutes. Use paper towels to blot and lift the rehydrated portion gently. Add more vinegar and keep blotting till all the stains have been lifted. Sprinkle baking soda generously over the area and let it sit for about 2 to 3 hours. Vacuum over the affected area once again to remove the baking soda. It will remove any leftover stains as well as smells. Spray some disinfecting solution over the affected area, and you just cleaned! Cleaning dog poop stains from a wool carpet do not need to be an ordeal. The first thing you can do is do a spot cleaning treatment using a vinegar solution on your wool carpet. Mix ¼ cup white vinegar, 2 cups warm water and a few drops of dishwashing liquid and make a mix. Pour this over the stain and let it soak for a few minutes. Scrub the area gently, carefully enough to not spread the stain further. For the next step, mix some shampoo with vinegar into cold water and mix it well. Using a brush, apply this mixture in one direction on to your wool carpet. Let it sit for a while. Rinse the wool carpet under running cold water. It will force the remaining stains out of the carpet. If needed, you can scrub it gently using your fingers. Squeeze out the excess water from the wool carpet before allowing it to dry. Even after properly cleaning out the dog poop stain, the scent often lingers behind on your carpets. In this case, the best way to remove the dog poop smell is to eliminate all the residue from the carpet and use a stronger smelling agent to get rid of or neutralize the odor. The first thing you can do is to sprinkle baking soda generously on top of the once stained area on your carpet. Allow this to sit undisturbed for about 2 to 3 hours. The baking soda itself is quite efficient in lifting most of the smell and having a neutralizing effect. Vacuum up the area to remove the leftover baking soda from your carpet. The next thing you can do is splash some lemon juice on your carpet, or even apply a disinfecting spray. Most of these sprays are scented, thus, killing the bacteria and germs from that area along with giving it a fresh, pleasant smell. Another thing you can do during this process is to keep your room well ventilated. It will help slowly get rid of the dog poop smell from your carpets naturally. Once you add the lemon or lime juice on your carpet, be sure to blot off any excess liquid from the carpet so that it does not get sticky. I also recommend the Simple Solution cleaner. It works great! Simple solution have an amazing line of products that will help pet owners. Very reliable and efficient. Hi, nice blog! Thanks for sharing your blog, it is quite interesting scoop of poop. Keep posting! Hey Philip, I like your post because it is very helpful for me. I have found some old poop spot and strain on my carpet. Maybe it happened before my dog was potty trained. You have shared some awesome ideas and some good product to clean the dog poop stains easily. Thanks a lot! I have a pet dog and I was worried about my carpet cleaning. Thanks for sharing this great resource with us. Hi there! I am one of the founders of Stain Fu. Thanks so much for mentioning us! One little nit to pick. It’s not that Stain Fu exclusively should not be rubbed or scrubbed – it’s *any* cleaning product on *any* carpet that should not be rubbed or scrubbed, unless you are 100% sure it won’t be damaged. The reason is because some carpet fibers are made of olefin or polyester, which has a lower melting point than say nylon. Additionally, rayon (also known as “art silk” or “banana silk”) fibers are very weak to start with, but lose even more strength when they get wet from water or any pet stain remover. When you rub or scrub a stain, you build up friction. This friction can cause these weaker fibers, or fibers which have lower melt points, to abrade, permanently untwist, shed, or even fall apart. Anyway, I thought it was important to point out that rubbing and scrubbing carpet in general is not necessary with a great stain remover, like Stain Fu. That said, some agitation does help to break up soils, and that’s why we recommend using a dull metal spoon or metal spoon handle. Using plastic utensils or any type of brush can cause some types of carpet to become damaged, so it’s best to stick with a non-sharp metal surface, and a metal spoon handle is perfect for this usage.